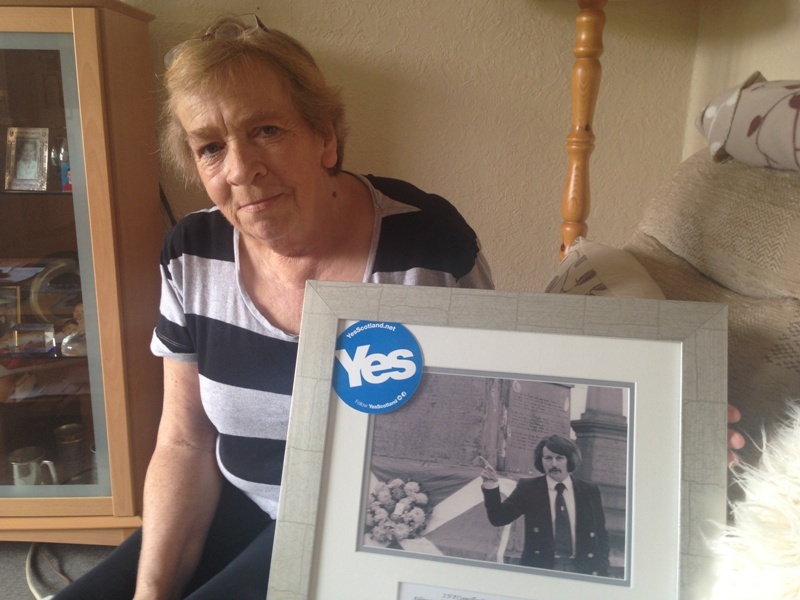 “I am voting Yes in the referendum, because that’s what Jimmy would have done,” said Cathy Mitchell, Cllr Mitchell’s widow. Councillor Jim Mitchell, who passed away in January 2011, was more than a local councillor, he was a Paisley institution representing his constituents for 34 years in Renfrewshire Council (and its predecessor councils). A proud Buddie and staunch St Mirren fan, Jim Mitchell was the backbone of the SNP and its council group for many years. Jim was a hugely popular figure, whose funeral in the Paisley Town Hall was attended by locals, friends, colleagues, opponents and family. Jimmy was described by many as a ‘legend’ for his unique ways of hitting spreading the independence message. “My husband was a passionate supporter of Scottish Independence, he always believed that Scotland would be a better place if only the Scottish people were allowed to make all the decisions Scotland. “He dedicated his life and energies into making Paisley and Scotland a better place, representing local buddies for over 30 years. “He inspired me to support the cause of Scottish Independence and he will be in my heart on 18th September when I cast my vote for Yes. “Jim Mitchell was an inspiration to many people not just in Renfrewshire, but across Scotland. He was dedicated to his family, his community and his country. “He knew the importance of standing up for what you believe in and always doing your best for the people you are representing. “Jimmy campaigned over the years longing for a chance to get Scottish Independence but won’t be here on the 18th September. He would be giving everything to win for Paisley. This entry was posted in Uncategorized by KennyMac. Bookmark the permalink.